ishes, cabbage, Brussels sprouts, cauliflower, kale, collard greens and arugula. These vegetables are p acked with antioxidants which may help lower risk of certain cancers and coronary heart disease. They are rich in vitamin A, vitamin C, vitamin K and folic acid. They are also rich in minerals such as potassium, iron and selenium. Cruciferous vegetables are healthy for the eyes. They contain carotenoids which help prevent diseases related to the eye. Cruciferous vegetables are rich in vitamin K which helps regulate the inflammatory system when you are sick or injured. They also contain omega 3’s which play a major role in regulating your inflammatory system. 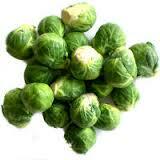 Cruciferous vegetables are high in fiber. 100 calories worth of these vegetables provide about 25-40% of your daily fiber needs. Cruciferous vegetables can contribute to a surprising amount of protein to your diet. 200 calories worth of steamed broccoli provide you with nearly 20 grams of protein. When consuming raw cruciferous vegetables the enzymes remain active and are more likely to be absorbed in the upper GI tract, transported to the liver and made available to other tissues in the body. When consuming the cooked form of these vegetables the enzyme activity is nearly nonexistent and the digestive products are more likely to pass through the upper GI tract unabsorbed and continue down into the lower GI tract (colon) to be metabolized by bacteria. This has been shown to help reduce the risk for colon cancer. To increase the enzyme activity to benefit the upper GI tract with cooked vegetables it is recommended to allow the vegetables to sit for several minutes after chopping prior to cooking. Start making an attempt to add cruciferous vegetables to your daily meal routine!